All of our commercial site furniture is available in three different mounting options, so you can choose the type that is most functional for your environment. Use this guide to compare the outdoor furniture mounting options we have available and choose what is best for you! The portable mounting option provides you with the most flexibility. You can position your portable outdoor furniture on any surface and it is easily movable. If you’re certain your site furnishings will need to be moved often, this portable option is best for you. Any portable architectural furniture does not have pre-drilled holes. 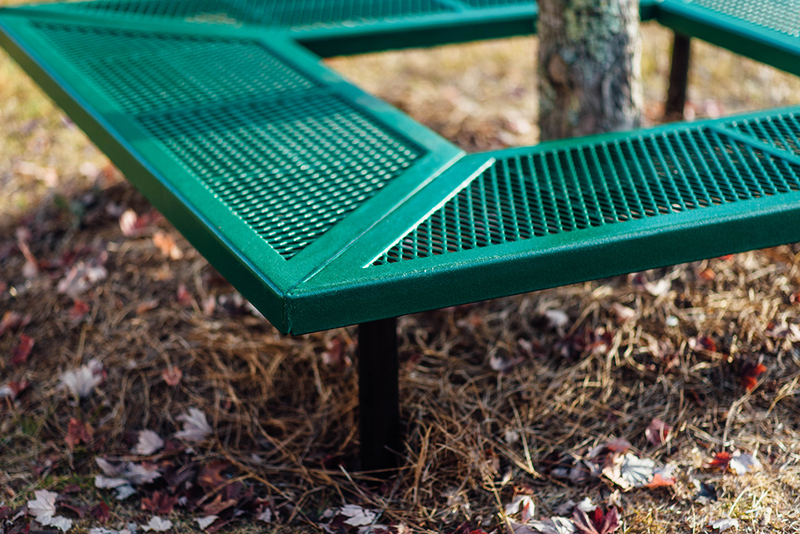 The surface mount option provides a happy balance between stability and security and is a great choice for items such as commercial park benches or commercial bike racks. This option includes hardware for mounting and pre-drilled holes that make it easy to mount to the ground surface. Simply remove the hardware if you need to relocate your site furniture. This option works best for asphalt, concrete, or other material that can be drilled through. The in-ground mount is the most permanent and secure option for your outdoor furniture. To mount your furnishings in-ground, the legs are to be buried in the ground with dirt and pre-poured concrete. Site amenities with this option are not meant to be moved once installed. It provides you with the most security and very little worry about theft. This option works well with items such as park benches and tables. Protect the commercial site furnishings at your facility.